Recently I had become frustrated with my management – or rather lack of management – of my email inbox. As a business owner, a blogger, and an information junkie, I often scour the internet looking for information that will help me run my business or help me help my clients and readers run theirs. When I found something interesting I would usually be offered an invitation to subscribe to an email newsletter or blog feed via email. I usually accepted that offer. While this had the benefit of keeping me informed about new content, it had a very big downside. My inbox was getting filled with emails that were not written for me alone. I was getting hundreds of emails a day. Emails that required a response or an action from me were getting lost in the noise. To solve that problem I gradually started switching all my subscriptions to my Gmail account. This helped at first because it did start clearing up my inbox. But that wasn’t really working either. First of all, now I had two places to access mail. To access my Gmail account I had to log in and read it from my web browser. It just wasn’t a part of my daily routine, so I wasn’t logging in. This led to a new problem. Because I wasn’t logging into my Gmail account regularly, I started re-subscribing with my main email address to feeds and newsletters that were very important to me. Now I was getting them in two places. Arrrrrrrrrgh! Next I tried RSS. RSS is that little orange button you see in the upper left of this blog. If you subscribe using that button and use a feed reader (which is how you access your RSS subscriptions) you get updated whenever I write a new blog post. No more inbox. The problem with that is I’d never had any real success with RSS readers before. I’d tried using the feed reader function of the Flock web browser but found that I had so many feeds it was slowing the browser down to a crawl. Then I started using Google Reader. Instead of having everything go into my Gmail account, I could have my subscriptions go into Reader. And because the data is on Google and not downloaded into my browser as with Flock, it wouldn’t slow everything to a crawl. However, I found Reader annoying to use. First of all, it’s ugly! Really, really ugly. I hate looking at it. Second, I found it not very user-friendly. The column on the left lists all the sites I’ve subscribed to with a number beside each website telling me how many new posts are there. The problem is, until I click on the name of the website and Reader opens a page for that site, I can’t see what the new content is. Just because I subscribed to the feed doesn’t mean I’ll read everything there. Because of this need to click to see what the headlines are for each of the sites on top of the ugliness factor, I found I wasn’t using Reader very often either. It seemed to take too long. I couldn’t see at a glance what was new so I just didn’t use the tool. Back to filling up my inbox. Until I went to Podcamp Toronto. There I attended a session called “Hacking Your Workflow”. Session leader Leona Hobbs shared some of her favourite technology tools: Feedly. Feedly is a plug-in for the web browser Firefox. Once installed, it works with your Google Reader subscriptions to make a magazine-like page of your subscriptions. It makes it pretty! 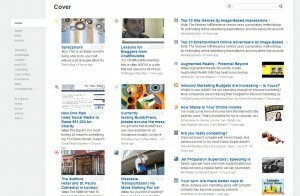 The “cover” page is created with random bits of the latest items from your subscriptions. Like a print magazine, the layout is a mix of shapes, sizes and has images. Not only can you see the title of the article and the blog it came from, you also see the first line of the post. Finally, I can see at a glance whether there is something I want to read. Even better, each subscription can be tagged with one or more keywords. Then if I want to see feeds that are related to that keyword, I can choose it from the list on the side and suddenly Feedly is giving me only those sites that I’ve tagged with that keyword. I can also share with Twitter and Facebook right from Feedly. I can save individual articles that I want red flagged for rereading later. I can import my Google Alerts. All I can say is I’m in love with Feedly! I am now reading more relevant content than ever before and my inbox is marvellously empty. Are you using RSS? How do you access it? Leave a comment and share your favourite tool. Thanks, that cleaned up my Google Reader in minutes! Now I might actually read some of these postings. 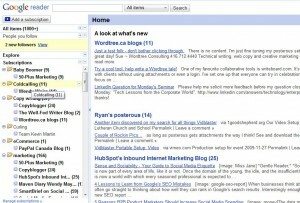 I use Google reader through my iGoogle homepage. It is much more visually appealing and streamlined.